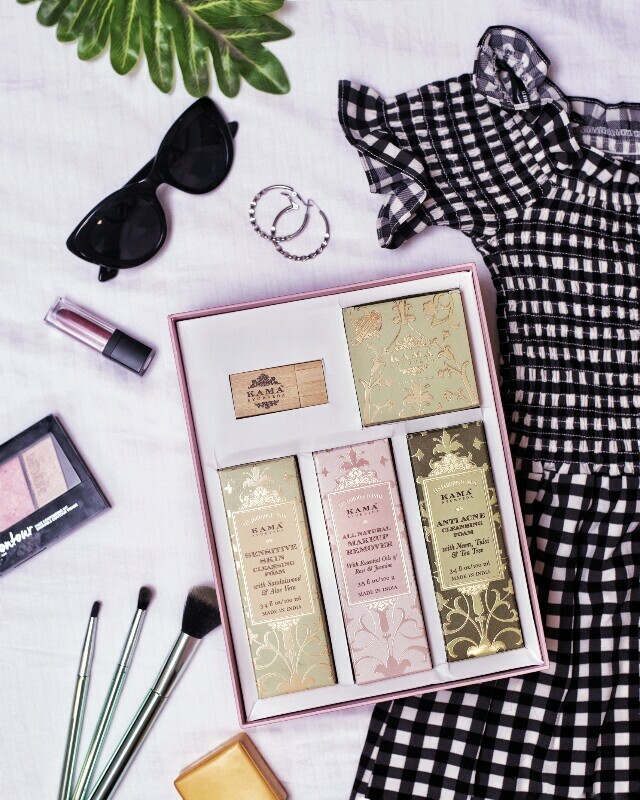 I have been using Kama Ayurveda as a part of my skin care regime since last year and I'm totally hooked to it. 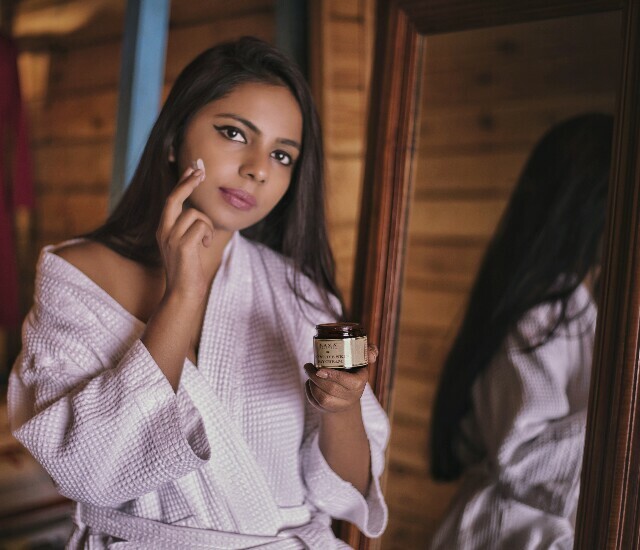 So, when I got the news that Kama Ayurveda has come up with a new line of products, I was super excited to try them out. The Kama Ayurveda team was super generous and sent me all the 4 new products from their new launch. And after using them for 15 days I’m ready to share my review with all of you! Before going ahead with the review I would like to state the fact that my skin type is normal to dry. This 100% Natural formulation is kind on sensitive skin, and effective on stubborn makeup. Blended with Natural Oils and Butters, the delightful crème texture buffers against dryness, stinging, and redness, and post-inflammation breakouts. The therapeutically decadent blend of Organic Olive, Jojoba, and Castor Seed Oils, with Vitamin E-rich Shea Butter, replenishes dehydrated skin. It prevents premature ageing, lending skin a wholesome sheen. The All Natural Make-up Remover comes in a squeezable tube packaging which makes it extremely travel friendly. The consistency of the cream is buttery with a mild floral fragrance. A grape sized amount of the product is enough to get rid of all the makeup on your face. I usually start with massaging the cream on my face with my hands and follow it up by wiping my face with a damp cotton. The makeup is removed in a single wipe however I like to follow it up with a face wash to ensure that my face is squeaky clean. The make-up remover does get rid of even the most stubborn eye makeup and lip color effectively. The all natural make-up remover with ingredients like pure essential oils removes the makeup gently without causing any irritation or breakout. My skin is left feeling extremely soft, smooth, and clean. INR 795 for 50ML and INR 1495 for 1oo ML. 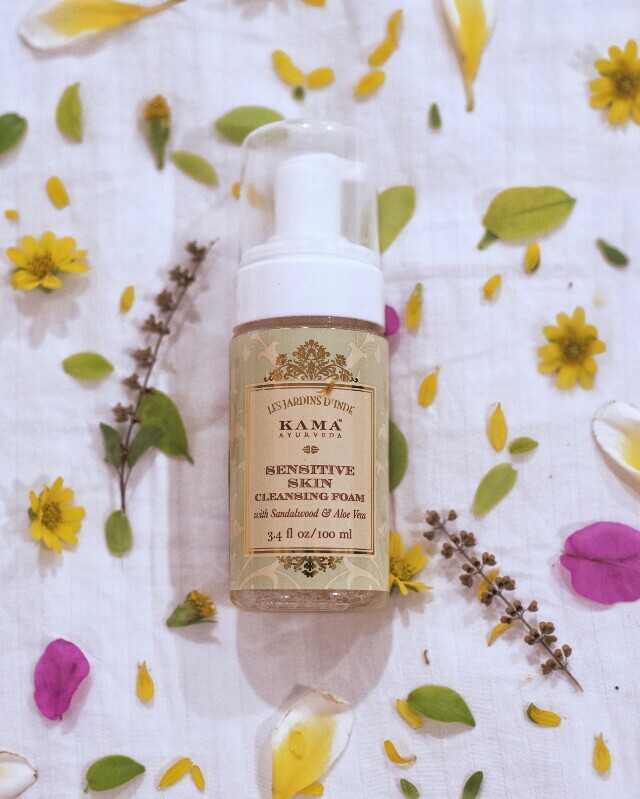 The Kama Ayurveda Sensitive Skin Cleansing Foam comes in a sleek pump packaging. The pump dispenses just the right amount of the product and the small cap is tight enough to prevent product leakage. The cleansing foam is white in color and 1 pump is sufficient to cleanse the face. I require 2 pumps on each usage to cleanse off my entire face. The fragrance of cleanser is of mild sandalwood which is very soothing. The cleanser lathers well when it comes in contact with water and cleans the face efficiently and removes dirt, oil and grime. It leaves the skin soft and smooth without drying out the skin. The presence of Aloe Vera provides intense hydration without causing any redness or irritation. The cleanser is a winner for all skin types. What makes this Cleansing Foam special, is that it uses safe, plant-derived acids (Salicylic Acid and Allantoin), instead of the synthetic variants. It is a gentle, yet potent acne-clearing cleanser, that reduces breakouts and blemishes for soft and healthy skin. 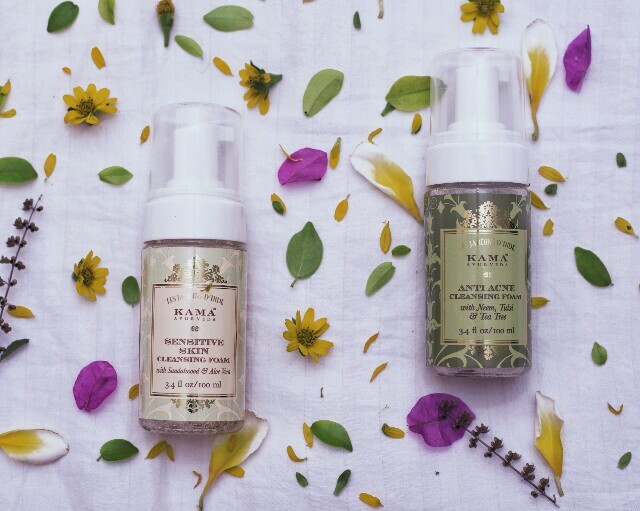 Powerful Neem Oil actively reduces pimples, while lessening post-acne scarring and restoring lost moisture to skin. Purifying Tulsi detoxifies, clears blocked pores, and protects against further inflammation without over-drying. Clarifying Tea Tree combines with Wintergreen-derived Salicylic Acid, to deep cleanse, reduce breakouts and boost the process of skin renewal. Pure Calendula Flower and Aloe Vera Extracts cool and soothe acne-ravaged skin,leaving it calm, smooth and comfortable. These are supported by Comfrey-derived Allantoin, a mild conditioner and healer for damaged, distressed skin tissue. INR 595 for 50ML and INR 1295 for 1oo ML. The Kama Ayurveda Anti-Acne Cleansing Foam comes in a similar pump packaging as the sensitive skin cleansing foam. As I don't really have any acne issues I haven't used this product yet. However, my mother has been using this product and she is absolutely loving it. The cleanser has a mild fragrance of neem and tulsi. The presence of Salicylic Acid prevents the occurrence of acne to a great extent. Also, the medicinal properties of neem and tulsi purifies and cures the skin naturally. The cleanser has reduced the pimples on my mother's face effectively. Also, it is pretty gentle on skin and cleanse off the dirt without drying out the skin. It is suitable for all skin types, especially for oily skinned beauties. A comforting day Cream, ideal for sensitive skin prone to painful swelling, bouts of allergic reactions, dryness, and stinging. This is a daily moisturiser, that strengthens the natural protective barrier of sensitive skin, while delivering a boost of moisture. Calming Calendula Oil softens and soothes inflammation, while reducing visible redness. Safflower Oil-derived actives fortify the lipid barrier of skin, and help maintain its natural balance. Natural Cornstarch and Beetroot Extracts restore, and protect hydration levels. Pure Sandalwood Oil cools and calms skin to provide relief from discomfort and breakouts, and also lends this Cream its alluring fragrance. A little goes a long way with this Sensitive Skin Day Cream. The Kama Ayurveda Sensitive Skin Day Cream comes in a brown glass tub with black lid. The tub is really cute and has all the essential information written on it. I personally don’t prefer tub packaging for hygiene reasons but you can use the product up to the last drop. It has a pleasant mild floral fragrance that instantly relaxes the tired mind and makes you feel rejuvenated & refreshed. The texture of the cream is really light and blends into the skin like magic. After cleansing and toning my face I take a pea-sized quantity of this cream and massage it on my face & neck. It moisturizes the skin really well leaving my skin soft, smooth and nourished. The cream is extremely light and provides enough moisture to my dry skin without making it look greasy. The only drawback I could find in this product is that it doesn't have any SPF. So you need to follow it up with a good sunscreen. 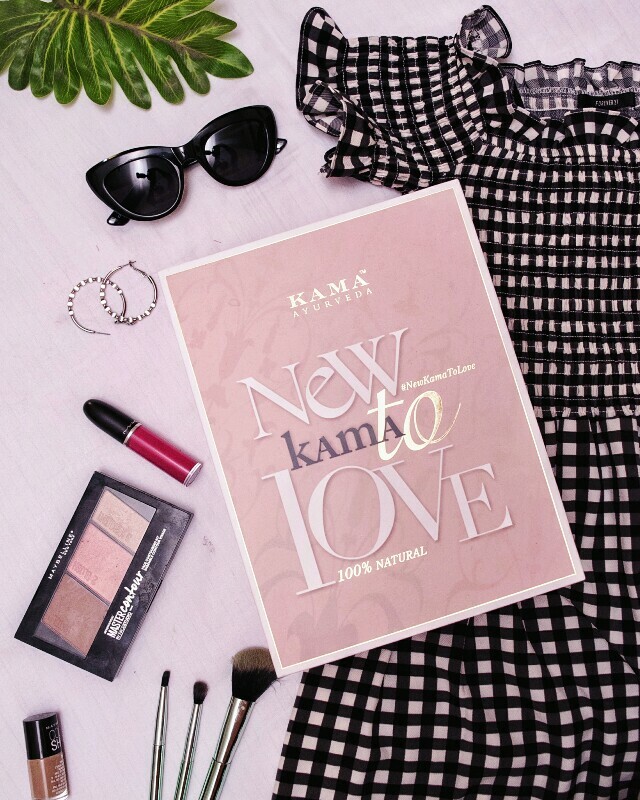 The New Kama to Love range is available across all Kama Ayurveda stores in India and their online website. ABC mobile institute of technology is the best led tv repairing course in Delhi. we provide you with the best training of repairing led and LCD in Delhi. that was really a nice one keep this work up.